BMW is 100 years old this year, and to mark the occasion, it’s been showing vehicles it believes are an indication of the next 100 years. We’ve already seen the BMW car of the future, Mini of the future, and Rolls-Royce of the future, but here at Canada Moto Guide, we don’t care about them. We’ve been holding out for the motorcycle of the future. It glided onto the stage this week here in Los Angeles and CMG was front and centre, of course. 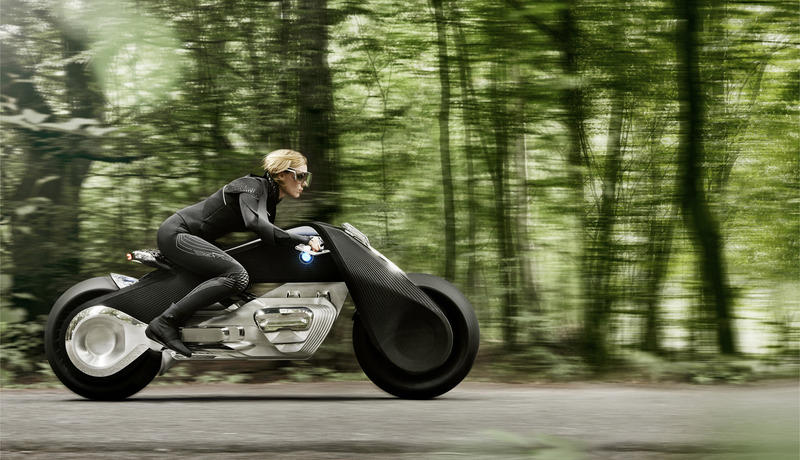 The full details of the bike are given here in this press release from BMW, and you really should give it a read over. If you want to know more about the mystery woman riding the motorcycle, her name’s Michaela and we had a chat with her here. 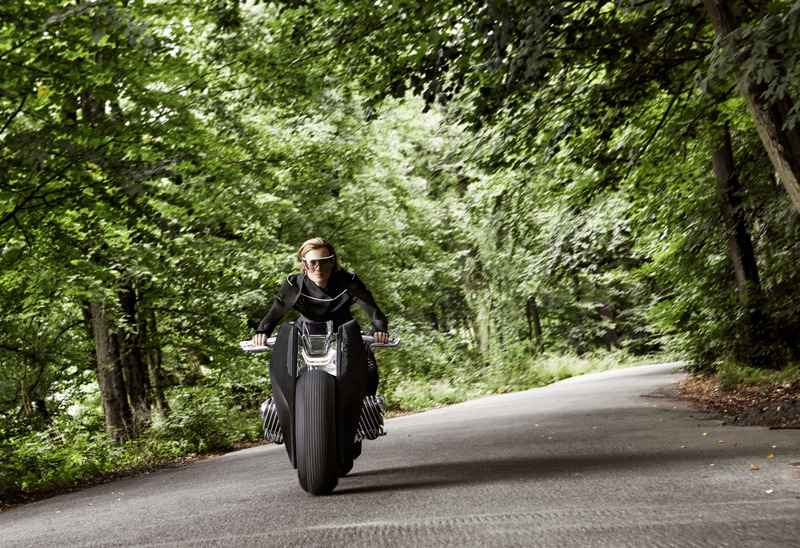 The BMW Vision Next 100 motorcycle is fascinating stuff: a bike that keeps itself upright and knows just how much to lean, and also watches out for other traffic and hazards, so it’s essentially uncrashable. 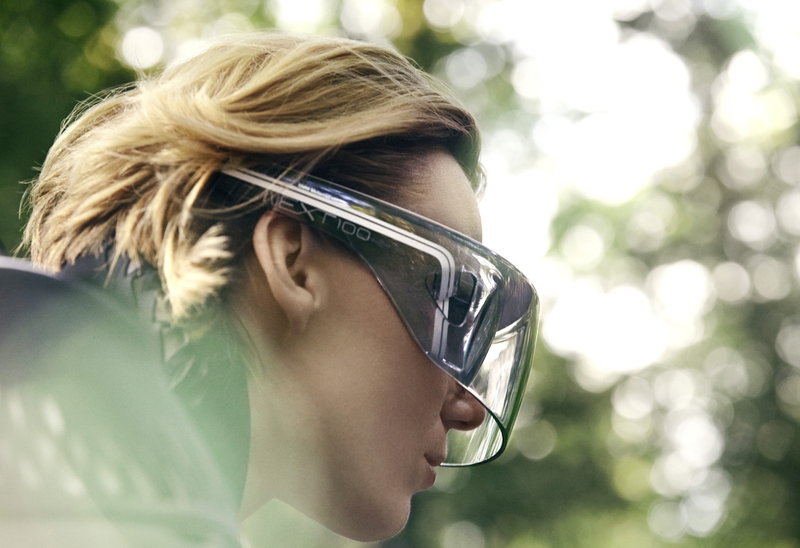 In this future, there’s no need for a helmet or leather jacket, because you’re not going to crash, so there’s a comfy suit to stay warm or cool, and a pair of stylish goggles with a heads-up display as an integral part of the instrumentation. Oh, and an engine and a frame that both flex for conditions. What kind of freak thinks this stuff up? 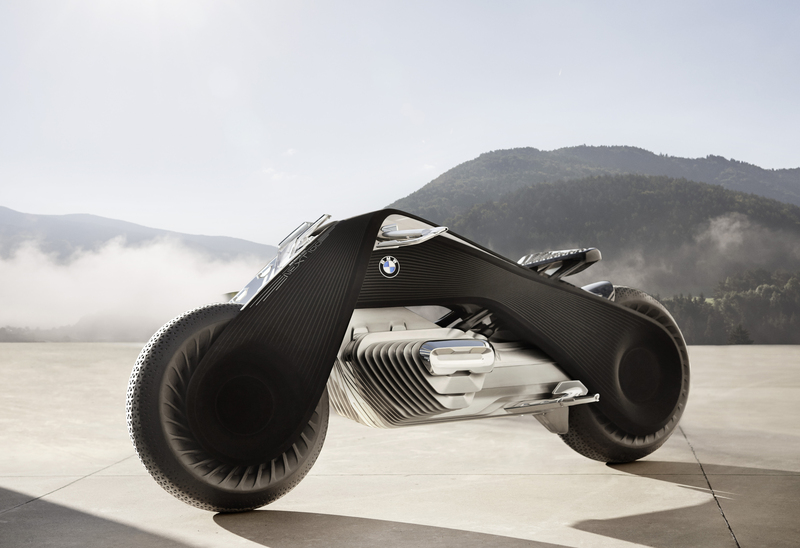 It turns out BMW employs a whole bunch of conceptual designers who are happy to be called freaks, and we had a chat with their leader, Edgar Heinrich, the head of design for BMW Motorrad. He’s a guy who owns 16 motorcycles of his own and who yearns for the good old days, but who helps decide what’s coming down the road. 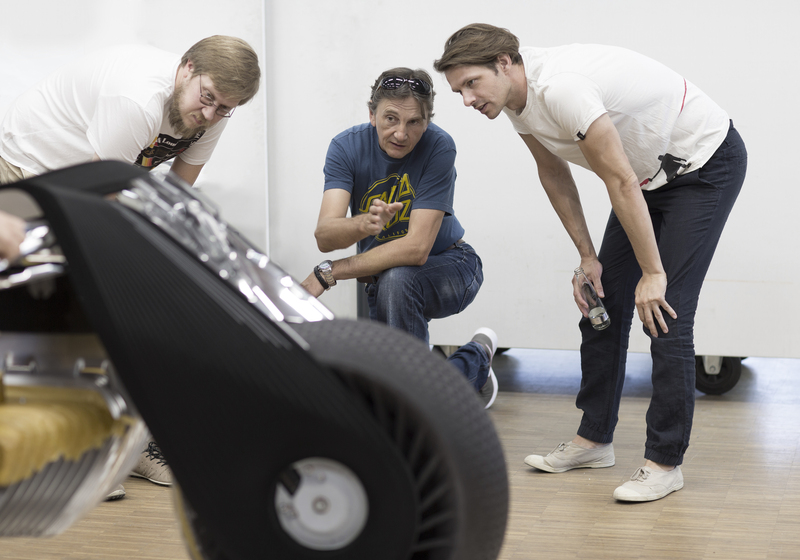 Edgar Heinrich, kneeling between two of the design team, figures out something with the BMW Vision Next 100 bike. CMG: Which of the various technologies on this bike that we do not yet have, do you think will be the first for us to get? HEINRICH: There are several things. The first is this connectivity thing. We can take information from the cloud to give more information to the rider, especially for safety. This could be pretty soon. We have it in cars – it’s technology which is out there. There’s also the use of carbon fibre in bikes, which really can replace other materials. That’s big for weight of course, and for carbon emissions (in its creation) and in packaging. But we already have lots of carbon fibre in motorcycles. What use of carbon fibre in this bike is innovative? How many years away is that? Erm – Less than two? Mid-term! How long did it take to create the bike? I would say, from the beginning, one and a half years. Sketches were earlier, of course, but we started building the whole thing about 18 months ago, more or less. But there were some obstacles which had to be overcome, so it was not so easy. Some technical things. Can you talk about that process? The goggles are a big part of this bike – that’s the instrumentation. Are they actually something that exists at the moment, or are they pie in the sky? You have these head-up displays already in cars. The technology is already here, it just has to be guided. The basic idea was we wanted to remove all this user-interface. It’s of no use to look at the gauges – you want to look at the road, or the environment. The idea was it should be more like horse riding: You want to really be free and not be controlled by these things – it should be the other way around. I want to control it. If there’s a risky situation coming up, the bike knows it and if I don’t react in time, the bike will sort itself out. In the future, autonomous cars will be standard. Safety and ‘green’ will only improve. And then, the job is to make a cool motorbike for this environment. So if I ask my guys, what do you want? they say, to have a cool bike and ride like my dad. I don’t want to be unsafe, and I want to be legal doing it. I can tell you that in 30 years from now, you will be able to have an absolute analog experience by using it without a helmet and without riding gear, and everyone can do it. On the other hand, an experienced rider can have even more fun because the bike will actively boost you. Is this the motorcycle of 100 years from now, or 30 years from now? Actually, you can’t even predict 10 years. Let’s look at the time horizon. I’m very well aware that, if I look at Flash Gordon, whenever they try to predict the future based on the present, sometimes it’s just cheesy. But that’s okay. In 30 years, I won’t be here. Do you see the day in 30 years when you will not need to have a driving licence? You know this video game, GT3, where you log in and you start with a rusty old Beetle, and you can only drive 100 km/h? And then you can slowly move up? This is actually something that I very much see. Basically, you get something like a licence on a smartphone, or something, and then you have to prove to the bike that you’re able to do this or that level. This bike could control it. Then, when you’re good enough, you could access the next level. So a complete novice could buy this bike, demonstrate they can ride it to a certain level, and a new level of software will be released and this bike will improve and go to that next level? Yes – this is very realistic. Already, you have the same thing with these dongles on the S1000 RR. If you are improved enough, you can go to the dealer and buy your dongle for the RR and you have the full dynamic race optimization. Can you explain the principle of the expanding engine? Thanks for this question. 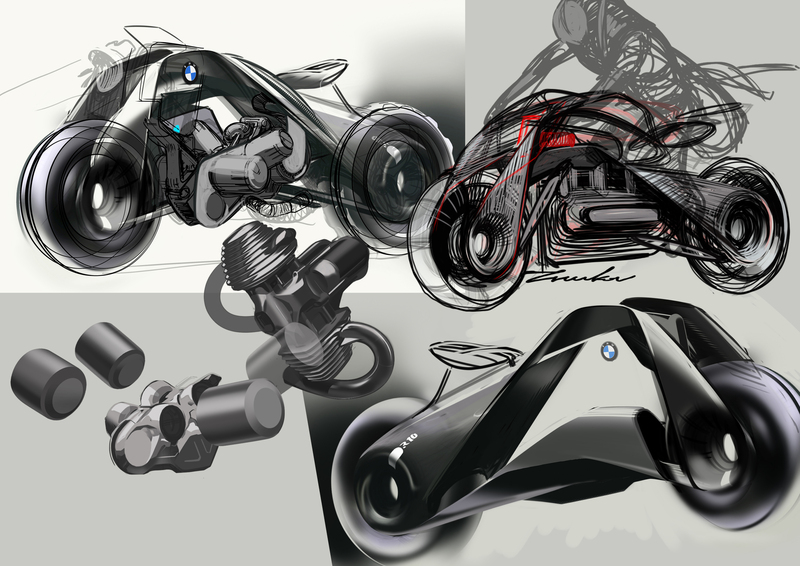 We wanted to use the BMW icons, and the boxer engine is more of the semantics of a BMW motorbike. 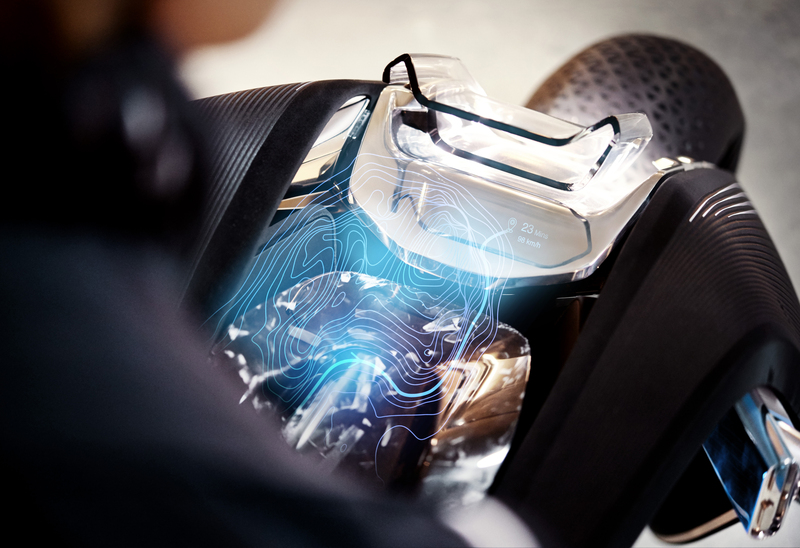 We said, okay, we don’t mention what engine is in there – it’s something zero-emission, not internal combustion – but whatever is in there, it might require some cooling. There might also be an aerodynamic effect, but the thing that is behind it is the mechanics. We really believe that mechanical engineering is the luxury of the future, especially when everything goes more and more digital. But the thing about electronics is that it’s always feeding the brain, but not feeding the belly. The semantics of mechanics is very, very important, I feel. In a world where everything is artificial intelligence and virtual reality, you want to be grateful for mechanical engineering. And this thing is a symbol for mechanics. It’s just mega-cool to have these moving, sliding things, and it’s metal, and it’s like 100 per cent analogue mechanics. In an environment where everything is so fast changing, what is still true? You need something to cling to, and some of these very iconic things must always be there. And this is much more important for the motorcycles than for cars. Kinda getting tired of hearing about this “bike”. 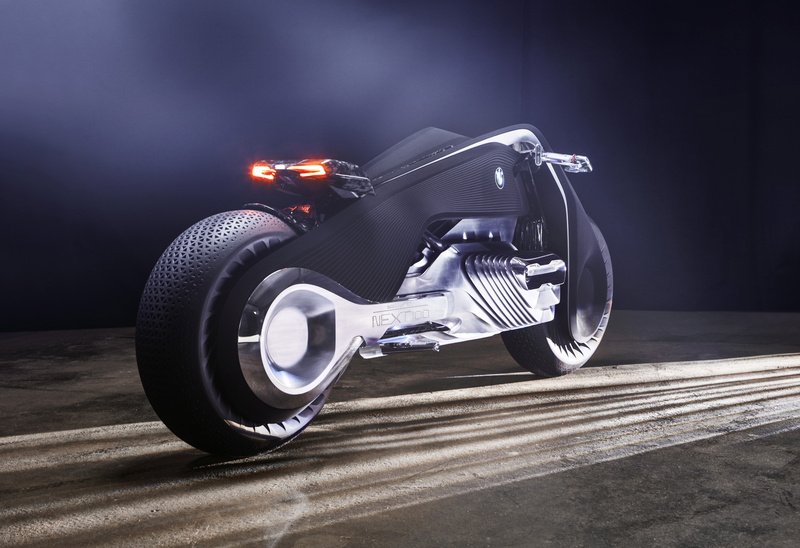 It’s a concept – doesn’t exist – may as well write an article about the new BMW Motorrad Unicorn.